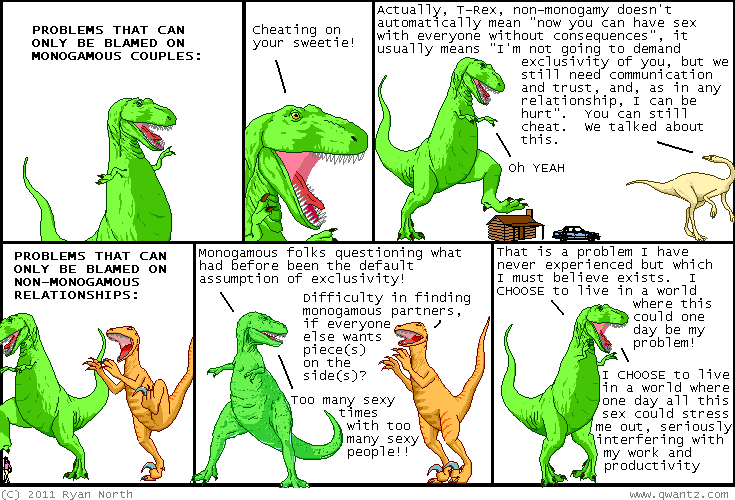 Dinosaur Comics - March 30th, 2011 - awesome fun times! There's an interview up with us about Machine of Death featuring some good questions and very pretty photography! Click the header to see how handsome we can be when there's a magic camera! Machine of Death Collector's Editions are over half gone, if you want the limited-edition hardcover, embossed death certificate, machine badge and death card then now is your chance! Wee Rex wants to totally hang out with you. Peanuts is sad but we all already knew this right? You're wearing a great top today; it really looks nice on you!